It is smooth and sophisticated, but there is a mystique about working with rolled fondant that keeps too many people from using it. Fondant reminds me of Play-Doh, you can create everything from an intricate wedding cake to a birthday cake in the shape of a Tonka truck. Your imagination and few helpful hints will open up a new world of cake decorating options. I chose this simple winter motif to get us started. 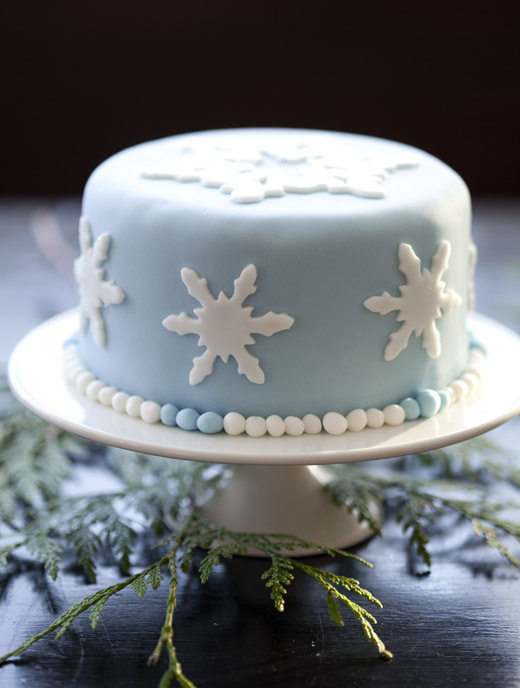 First, we have to choose our color and tint the fondant, next we’ll cover the cake in the perfectly smooth fondant and to finish we’ll add simple snowflakes. I’ve broken the videos into 3 parts: coloring the fondant, covering the cake and decorating. Enjoy and happy holiday baking! GORGEOUS! This looks like winter, wedgwood china. As my Grandmother would say, “It looks too pretty to eat.” Thank you for sharing this art form. Thanks for the wonderful videos! Just wanted to say Thank You…u are a fabulous teacher!!! I’ve never worked with fondant before, so your blog will be a great learning curve for me. I am moving closer to family next year and am hoping to start making presentable cakes. I know your blog will be an inspiration. btw, I just recently bought your “healthy bread” book for my kindle and look forward to making those gluten free bread recipes. I can’t wait to chew on a nice fresh loaf again! These cake is absolutely beautiful! Beautiful cake! So perfect for the holidays! By the way, I read almost all of your pizza book in 10 days :-). The first thing on my list is the deep dish pizza with savory brioche dough. The only problem is that I ran out of flour, and the next shopping trip is going to be in a week or so. So I have something to look forward to in the coming year. Happy 2012, Zoe! This was so helpful to me! Thank you for your video and picture tutorials!! This cake is gorgeous! I love to work with fondant, but it gets tricky for me sometimes. Thank you for posting it! Zoe, the link to Amazon.com for the vinyl is now dead and I’m trying to pull together the things I need for this recipe in advance. What is “heavy gauge” vinyl (30 gauge?) and how big of a piece do you go for…? I have found it at Joann fabrics in the past. Ask them for their heaviest gauge, I think it is used for covering furniture? You want a piece that is going to easily accomodate the largest cake size. Remember that you roll the fondant out much larger than the actual cake width. Hi Zoe, I love your blog! recently I made rolled fondant following your recipe, and made some nice butterflies and flowers out of them. I dried the decorations for about 10 hours at room temp. I then put them on a cake covered with cream cheese frosting and few hours after they started to melt. Do you have any idea what might prevent this? After that I did put the cake in the fridge (thinking it will dry out the fondant flowers) but apparently I made it worse. Thanks a lot for your help Zoe! The refrigerator is actually quite humid, so it makes fondant more tacky and sticky than leaving it at room temperature, preferably in an airconditioned spot. Making your fondant as thin as possible, so it will dry thoroughly will be helpful. You may need to let them dry out longer before attaching them to the cake. You can make the decorations days in advance, to make sure they are dry and stiff. thanks again for your generosity in sharing the tips and recipes, they’ve taken me out of a couple of tight spots! It is really just the save the machine from any stress. The fondant gets very thick and difficult to mix with the mixer. I’ve tried adding the color in the mixer and it actually takes longer to incorporate. Such a wonderful tutorial. I needed a refresher course and you were excellent. Your voice was clear and I understood you perfectly. Ten thumbs up!!! Thank you a thousand times!